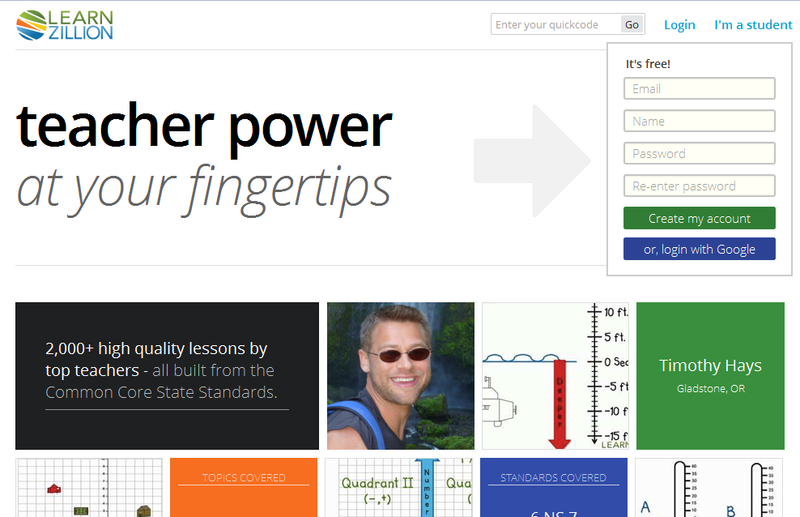 LearnZillion offers thousands of free Math and English Language lessons that have been developed by teachers directly from the Common Core State Standards. The terms state that teachers and parents who are the managers of a class can see information about their students or children in that class, such as the student’s or child’s name, school affiliation and activity on assignments (including time of activity and any responses to questions, extending to grades for those assignments). According to the terms Information collected from students is never used or disclosed for any third-party advertising or any kind of behaviorally targeted advertising. LearnZillion’s terms state that encryption, firewalls, and reasonable security measures are in place for data while stored and in transit. Lastly, LearnZillion's terms state that when school districts or teachers create primary accounts and invite students to create student accounts, they are acting on behalf of parents to give LearnZillion consent to collect student information described in their policies, and LearnZillion is acting as a service provider or school official to the school district or teacher. The terms state that teachers and parents who are the managers of a class can see information about their students or children in that class, such as the student’s or child’s name, school affiliation and activity on assignments (including time of activity and any responses to questions, extending to grades for those assignments). In addition, the terms of LearnZillion state that account administrators can delegate the right to access, modify, and delete student information to school administrators in accordance with district policy. According to the terms of LearnZillion, school districts or teachers can create primary accounts and invite students to create student accounts, and are required to act on the behalf of parents to give LearnZillion consent to collect student information. This can include student records and teacher and student information such as email address, grade level, and zip code. The terms also state that cookies and other tracking mechanisms are used for the purpose of directly supporting the purpose and development of the site. Additionally, the terms state LearnZillion does not ask or require students to provide information beyond that which is reasonably necessary to use the service. The terms further state LearnZillion does not sell or share any student login information with any third party and they do not automatically collect personal information from student accounts. According to the terms Information collected from students is never used or disclosed for any third-party advertising or any kind of behaviorally targeted advertising. LearnZillion’s terms state that encryption, firewalls, and reasonable security measures are in place for data while stored and in transit. According to the terms, data is only accessed and controlled by the primary account holder (teacher or parent). The terms further state that in the event of a data breach, LearnZillion will provide notification to users within 30 days. LearnZillion's terms state that when school districts or teachers create primary accounts and invite students to create student accounts, they are acting on behalf of parents to give LearnZillion consent to collect student information described in their policies, and LearnZillion is acting as a service provider or school official to the school district or teacher. For these types of primary account, all requests to review, delete or edit student information must come from the school district or teacher, and parents should make use of the school’s policies with respect to reviewing, deleting or editing student information. In addition, the terms state when parents are the primary account holders, they may delete or edit student information through the LearnZillion user interface or by contacting LearnZillion. If a school district or school requests deletion of data under the control of the school district or school, LearnZillion will promptly delete it, subject to any legal requirement to retain or transfer that data. The terms further state that any information students share with others on the service or content other students may have copied, is not a part of their account and may not be deleted when users delete their account. Lastly, the terms state that if LearnZillion shares student data with one of their service providers, they will require third parties to delete student data when they delete their account.